We’re big fans of Dremel tools and have enjoyed seeing their line expand over the years. The Dremel 8220 cordless is on the top of the tool pile and we’ve found extremely useful. Same goes for the Multi-Max and Saw-Max. They recently launched a couple of butane tools, the VersaTip and the VersaFlame. 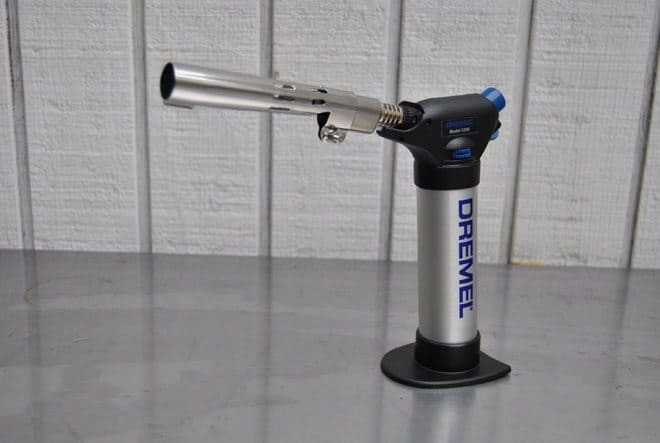 The Dremel VersaFlame is a mini-torch. Anytime you need instant heat, you just fire it up and its ready to go. It comes with a 9 piece kit shown here that includes multiple tips and can be used for soldering, stencil cutting, leather crafting, wood burning and sealing cut plastic rope and cords. The VersaFlame is useful for camping, DIY and any type of hobby. Burn time is up to 75 minutes on a full tank and it reaches temps of 1022°F – 2192°F. Read more about the Dremel VersaFlame and check out our quick video below.